We use both Near-field integrated technology and iBeacon proximity sensors to develop mobile application that enable you reach customers in new ways, providing them with innovative ways to interact with you and avail of your services. In addition to providing bespoke solutions encompassing this technology, we have developed an off-the-shelf loyalty solution which delivers comprehensive loyalty, engagement and analytic features. iBeacons are low-cost, low-powered transmitters equipped with Bluetooth that your phone recognises and triggers delivery of a proximity-based, context-aware messages. They are ideal for detecting smartphones indoors, where GPS isn’t always effective, and are accurate up to 10 centimeters, sending alerts and data to apps on engaged mobile devices. They are small unobtrusive devices that can be put on any wall, till or behind a merchandising display, in an office. They are location specific to help provide a better customer experience of a shop or service by interacting with consumers through a shop or a company’s Smartphone App, customers already present in the store are made aware of, and can take advantage of advice, special offers and promotions available right there right now. They connect to a mobile device via blue tooth. 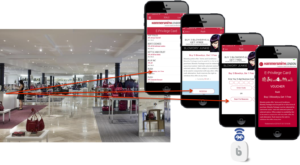 iBeacons allow you to targets a push message or delivers a voucher in store within a few feet or a few inches of a location reaching where GPS cannot. Example: Hammertsmith, 125th Street Harlem.